Today we have one of my personal favorites, a late-60s midsized Ford with a fastback rear. I've had a couple of these, including a '68 Mercury Cyclone that served as my daily driver for several years, so I know their flaws and strengths pretty well. Sure, the fastback shape was pretty much all about winning NASCAR races and selling cars to rabid Southern race fans, but is there any better reason for a body style? To be honest, these cars have handling best described as scary; with leaf springs in back and Ford's patented crapola 60s front suspension, they lean alarmingly in fairly mild turns and understeer like cement mixers. But with great big gobs of V8 torque under the hood, who the hell cares? One quirk of the NASCAR-friendly fastback design was the crazy trunk setup. The trunk itself is freakin' huge, extending forward about six feet. However, the trunk lid is an absurdly tiny hatch, which means that any object that's going into the trunk needs to fit through a very restrictive slot (even medium-sized cardboard boxes won't fit). That's bad enough, but the real problem comes when you put some object within easy reach of the opening and then brake hard during a drive; the object will slide all the way forward, which means you need to climb into the trunk to go fetch it. This is especially fun when you have a bunch of groceries knocking around in the trunk. Argh! This is pretty much the same front body as the '68 Ranchero we saw a while back. The Fairlane 500 trim level was a notch below the snazzier Torino models. 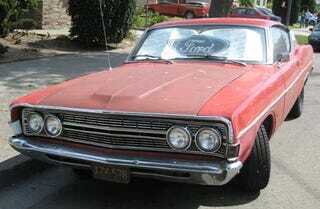 You could get the base Fairlane 500 with 2-barrel 302 for $2543; however, with the base '68 Road Runner with 383 going for $2870, I might have been tempted to spend the additional few hundred for the Plymouth. But wait! The 280-horse 390 was just an extra $284; another $184 got you the 4-speed. Hmm... Road Runner or big-block fastback Ford? And let's not even talk about the GM options (except to mention that you could get a new '68 Chevelle with 325-horse 327 and four-speed for only $2829). Toyota imitated this rear-side-glass/trim setup with their mid-70s Celica fastbacks; since they also imitated the grille and taillights, the overall effect was of a 2/3-scale, 10-year-old Fairlane. This one is missing some minor components, but it wouldn't be a bank-breaker to get it in fairly straight condition. Fortunately for Fairlane owners, Ford stuck with many of the same components well into the Granada/Monarch era, so lots of parts are quite common. This car definitely needs way more rubber in the rear wheelwells, preferably on widened factory rims with dog-dishes. A 427 would be nice, too.